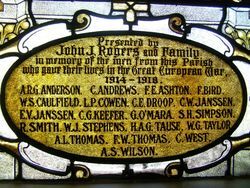 A stained glass window commemorates those from the parish who died in service or were killed in action in World War One. 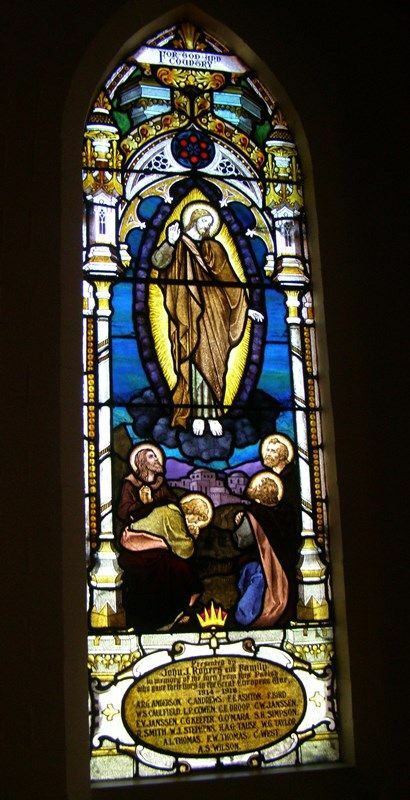 At St. Augustine's Church, Mentone, yesterday, a memorial window presented by Councillor J. J. Rogers and family, for the men of the the war, was unveiled by the Dean of Melbourne. Many returned soldiers attended to pay tribute to their fallen comrades. After the unveiling ceremony the Last Post was sounded. 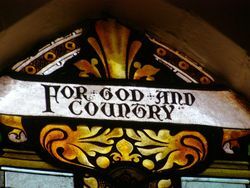 Dean Hart, Dean of Melbourne, referred to the gallantry and devotion of the fallen, and extended the sympathy of the church to their relatives. Herald (Melbourne), 24 November 1919.